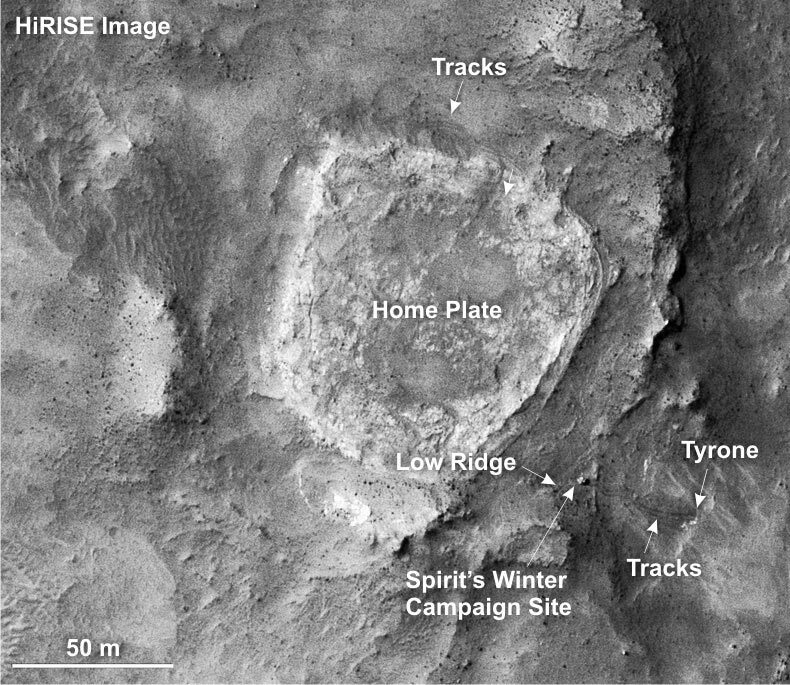 Rover Spirit as viewed by NASA's Mars Reconnaissance Orbiter. The orbiter's high-resolution camera took this picture on Sept. 29, 2006. NASA's twin Mars rovers, nearing the third anniversary of their landings, are getting smarter as they get older. The unexpected longevity of Spirit and Opportunity is giving the space agency a chance to field-test on Mars some new capabilities useful both to these missions and future rovers. Spirit will begin its fourth year on Mars on Jan. 3 (PST); Opportunity on Jan. 24. In addition to their continuing scientific observations, they are now testing four new skills included in revised flight software uploaded to their onboard computers. One of the new capabilities enables spacecraft to examine images and recognize certain types of features. It is based on software developed for NASA's Space Technology 6 "thinking spacecraft." Spirit has photographed dozens of dusty whirlwinds in action, and both rovers have photographed clouds. Until now, however, scientists on Earth have had to sift through many transmitted images from Mars to find those few. With the new intelligence boost, the rovers can recognize dust devils or clouds and select only the relevant parts of those images to send back to Earth. This increased efficiency will free up more communication time for additional scientific investigations. To recognize dust devils, the new software looks for changes from one image to the next, taken a few seconds apart, of the same field of view. To find clouds, it looks for non-uniform features in the portion of an image it recognizes as the sky. Another new feature, called "visual target tracking," enables a rover to keep recognizing a designated landscape feature as the rover moves. Khaled Ali of NASA's Jet Propulsion Laboratory, Pasadena, Calif., flight software team leader for Spirit and Opportunity, said, "The rover keeps updating its template of what the feature looks like. It may be a rock that looks bigger as the rover approaches it, or maybe the shape looks different from a different angle, but the rover still knows it's the same rock." Visual target tracking can be combined with a third new feature -- autonomy in calculating where it is safe to reach out with the contact tools on the rover's robotic arm. The combination gives Spirit and Opportunity a capability called "go and touch," which is yet to be tested on Mars. So far in the mission, whenever a rover has driven to a new location, the crew on Earth has had to evaluate images of the new location to decide where the rover could place its contact instruments on a subsequent day. After the new software has been tested and validated, the crew will have the option of letting a rover choose an arm target for itself the same day it drives to a new location. The new software also improves the autonomy of each rover for navigating away from hazards by building better maps of their surroundings than they have done previously. This new capability was developed by Carnegie Mellon University, Pittsburgh, and JPL. "Before this, the rovers could only think one step ahead about getting around an obstacle," said JPL's Dr. John Callas, project manager for the Mars Exploration Rovers. "If they encountered an obstacle or hazard, they'd back off one step and try a different direction, and if that direction didn't work they'd try another, then another. And sometimes the rover could not find a solution. With this new capability, the rover will be smarter about navigating in complex terrain, thinking several steps ahead. It could back out of a dead-end cul-de-sac. It could even find its way through a maze." This is the most comprehensive of four revisions to the rovers' flight software since launch. One new version was uplinked during the cruise to Mars, and the rovers have switched to upgraded versions twice since their January 2004 landings. Callas said, "These rovers are a great resource for testing software that could be useful to future Mars missions without sacrificing our own continuing mission of exploration. This new software will be a baseline for development of flight software for Mars Science Laboratory, but it's also helpful in operating Spirit and Opportunity." NASA's Mars Science Laboratory is a next-generation Mars rover in development for planned launch in 2009. Spirit and Opportunity have worked on Mars for nearly 12 times as long as their originally planned prime missions of 90 Martian days. Spirit has driven about 6.9 kilometers (4.3 miles); Opportunity has driven about 9.8 kilometers (6.1 miles). Spirit has returned more than 88,500 images, Opportunity more than 80,700. All the raw images are available online at http://marsrovers.jpl.nasa.gov/gallery/all/ . Currently, Spirit is investigating rocks and soils near a ridge where it kept its solar panels tilted toward the sun during the Martian winter. Opportunity is exploring "Victoria Crater," where cliffs in the crater wall expose rock layers with clues about a larger span of Mars history than the rover has previously examined. Opportunity's key discovery since landing has been mineral and rock-texture evidence that water drenched and flowed over the surface in at least one region of Mars long ago. 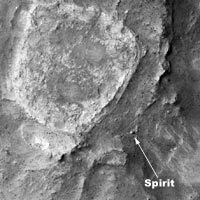 Spirit has found evidence that water in some form has altered mineral composition of some soils and rocks in older hills above the plain where the rover landed. -- Opportunity has analyzed a series of exposed rock layers recording changing environmental conditions from the times when the layers were deposited and later modified. Wind-blown dunes came and went. The water table fluctuated. -- Spirit has recorded dust devils forming and moving, events which were made into movie clips. These provide new insight into the interaction of Mars' atmosphere and surface. -- Both rovers have found metallic meteorites on Mars. Opportunity found one rock with a composition similar to a meteorite that reached Earth from Mars. NASA's Mars Technology Program and New Millennium Program sponsored development of the new capabilities included in the new flight software. JPL, a division of the California Institute of Technology, Pasadena, manages the Mars Exploration Rover Project for the NASA Science Mission Directorate. For images and information about the rovers, visit http://www.nasa.gov/rovers . For descriptions of technologies being developed for future Mars missions, see http://marstech.jpl.nasa.gov . For information about the New Millennium Program's Space Technology 6 mission, see http://nmp.nasa.gov/st6/ .